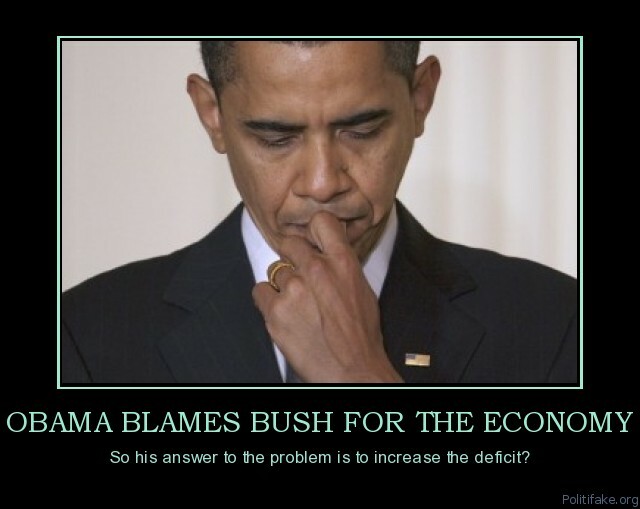 Will Obama and the media stop blaming Bush? I am sick of hearing about how everything (almost three years later) is still Bush’s fault! When will Obama “man-up” so to speak and take some responsibility? In order to fix things in your job or your life, the first thing you must do is admit there is a problem and then take responsibility for it. Bush is no longer president, for almost three years! Own up already, Obama. This entry was posted in For The Love Of All Things Sane and tagged blame, bush, obama. Bookmark the permalink. 1 Response to When Oh When…..
Is it possible for Obama to “own up” to anything? He has made several future generations hopelessly indebted. All the while, the Obama’s never miss a three hundred thousand dollar date night.